Free Cookie Day at Subway on 2/29 | A Savings WOW! Subway is having a free cookie day on Wednesday, February 29th. 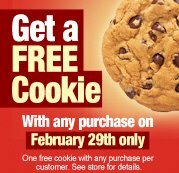 You’ll get a FREE freshly baked cookie with any purchase February 29th. Find your nearest Subway location.